A £1.7 million project to reduce congestion and improve safety at one of the busiest motorway junctions in the country is due to begin tomorrow night (Wednesday 27 August). The Highways Agency scheme at junction 26 of the M6, which links the motorway to the M58 and A577, will see an extra lane added to the northbound side of the link road between the M6 and the A577 Orrell Road. An extra lane will also be added to the end of the southbound exit slip road from the M6, and new traffic lights will be installed at the roundabout to the east of the M6 junction, known as Orrell Interchange. Sensors will be used to monitor the number of vehicles approaching the roundabout from each direction to improve the flow of traffic. Engineers will begin the project by pumping up to 10,000 tonnes of concrete under the fifth-of-a-mile link road between the M6 and the A577, after discovering a mining shaft less than ten metres below the surface of the road. They need to carry out the work to improve the stability of the land before they can begin widening the road. This initial work will require overnight closures of the link road between 10pm and 5am from Wednesday 27 August. The junction will remain open for vehicles travelling between the M6 and the M58, but a diversion will be in place for local traffic coming on or off the motorways at the interchange. The majority of the work for the rest of the project will take place overnight and will require some closures of the southbound slip roads, the roundabout and the link road to the A577. Weekend closures will also be required of the link road between the eastern roundabout at Orrell Interchange and the A577 Orrell Road, between 10pm on Fridays and 5am on Mondays. Details on the dates of the closures and the diversions will be announced nearer the time. Some lane closures will also be required during the day at the junction, with a temporary 50mph speed limit in place throughout the project for the safety of motorists and workers. The scheme is due to be completed by February 2015. Anyone who regularly uses the junction will know how busy it can get at peak times, with traffic often queuing to get onto the M58. 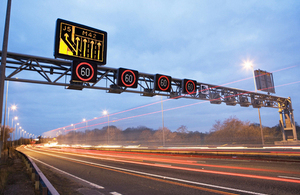 In fact, our records show it is one of the busiest motorway junctions in the country. The extra lane on the A577, the new traffic lights on the roundabout and the improvements to the southbound exit slip road will have a significant impact on tackling congestion at the junction and improving journeys for motorists. There will inevitably be some disruption while this work takes place but we’re doing everything we can to keep this to a minimum by carrying out the vast majority of the work overnight. This is a major scheme which is designed to have a significant long-term benefit for both the local and regional economy. The M6 project at Orrell is one of 123 in the Government’s £317 million ‘pinch-point’ initiative – a two year programme of targeted works being delivered alongside larger schemes and routine maintenance and improvements along the strategic road network. The pinch-point programme, devised with the input of councils and local enterprise partnerships, is designed to help stimulate new development and local economic growth by improving road safety and tackling congestion bottle necks. In all, 28 projects, worth £66 million, are being delivered across the North West. Earlier this year, the Highways Agency set up temporary drilling rigs at the motorway junction to drill holes up to 30 metres into the ground to carry out tests, as the motorway was built in a former mining area. The tests concluded that the work to improve the junction could go ahead, once part of the mining shaft under the link road had been filled with concrete.